Ask Anna: Color of the Year — Anna Akbari, Ph.D. Question: What is the color of the year? Why do we have one, and who decides? You might be surprised to know that the color of the year is emerald, or even that there IS a color of the year. Annually, the color is chosen by a company called Pantone, located in New Jersey, who are the “world renowned authority on color,” according to their website. They’re well-known within the art and design community for standardizing the color matching system, applied to everything from textiles and plastics to paints and digital swatches. The color they select each year is meant to capture our collective “zeitgeist,” and perhaps even influence it. 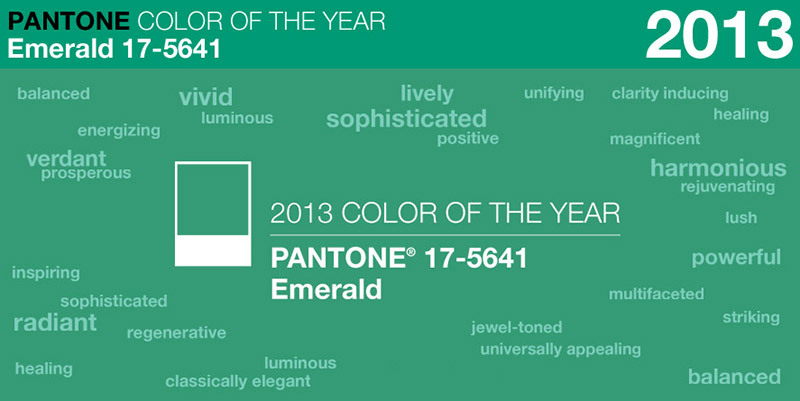 So what’s the significance of Emerald and why did Pantone choose it to set the “tone” for 2013? In many cultures, emerald is a color of renewal and beauty. Symbolically, it is rejuvenating and provides clarity – much needed in today’s complex, ever-quickening world. Associated with gemstones (obviously) and a sense of luxury, it’s been more and more prevalent in both fashion and home decorating for the past few years, as we seek to refine our lives and return to a notion of classic elegance. While I haven’t seen any direct link between this year’s color and the green movement, it’s worth contemplating a connection. Emerald is a more regal, sophisticated shade than the kelly green usually associated with “going green,” and yet, it’s a subconscious reminder to incorporate sustainability into our lives – without sacrificing style and elegance.